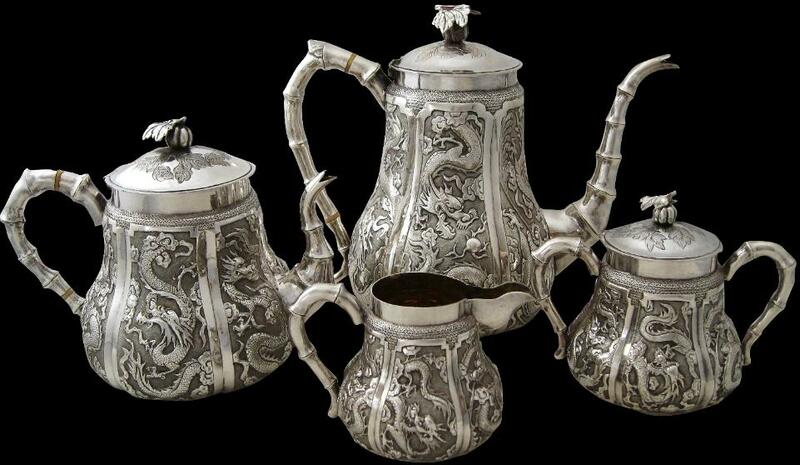 Four-piece Chinese export silver tea and coffee sets now are relatively uncommon. Furthermore, sets decorated with dragons whilst iconographically might well be sound often are not aesthetically pleasing. This set however is balanced, finely executed and elegant. 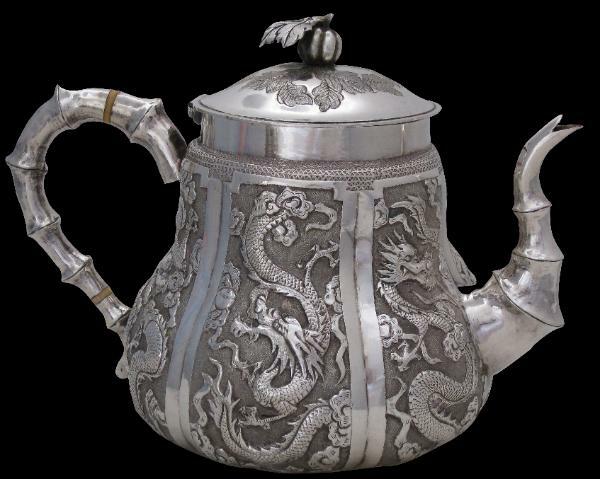 The body of each piece is decorated with six panels each of which contains a dragon frolicking amongst the clouds, all against a ring-mat background. The shoulders of each piece are embellished with a repeated motif based on the prunus or plum blossom. 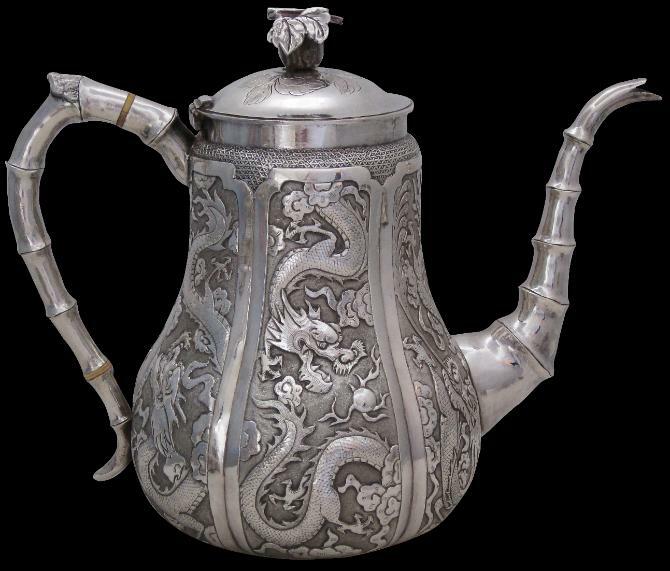 Each piece has a handle or handles stylised as bamboo – those for the tea pot and coffee pot each have two ivory heat insulators to prevent the handle from becoming too hot . 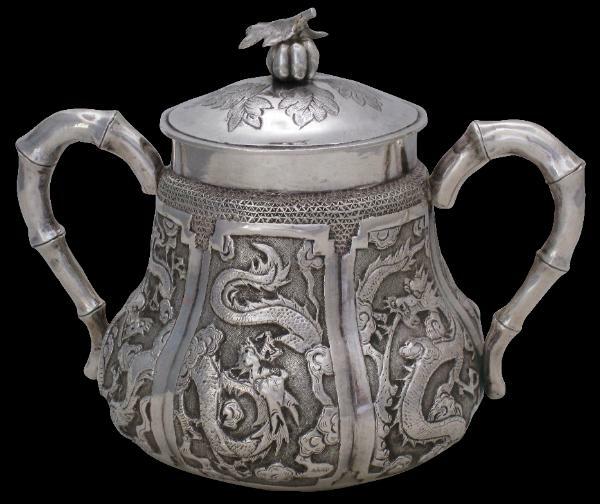 The coffee pot, tea pot and sugar bowl each have lids that are finely engraved with leaf patterns and are finished with a pumpkin and leaf finial. The interiors of each piece have a gold wash and the base of each is stamped with a Chinese ideogram that reads ‘Jian Ji’ (literally, ‘Brand Build’ – most probably a brand name for a retailer or maker) and ’85’.